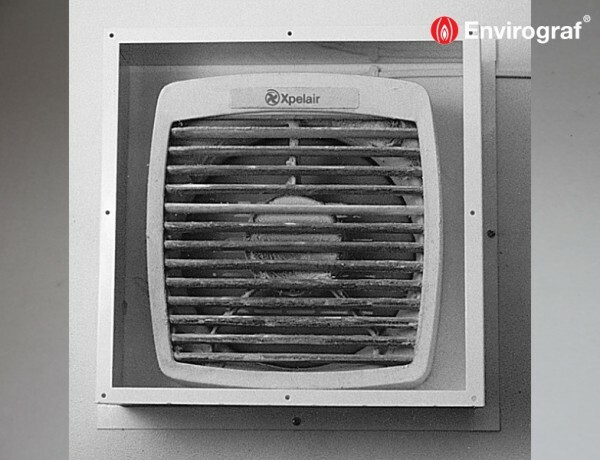 A cover for fan units mounted on either walls or windows. The cover fits around the fan unit and is affixed to the wall or window. The unit is fronted with an MG Grille (Product 35), fitted with intumescent strips to expand in a fire and seal the openings, thus preventing fire and smoke from spreading. either side of the glass, between the internal rear section of the fan and the external front section. The fan unit is then constructed and fixed as usual around the plates. The grille unit is attached to the externally fitted plate with self tapping screws. For use with Vent-Axia, Expelair and other fan types. Please contact Technical Department for further information. Contains a front MG grille, tested to BS476 Parts 20 & 22 (1987), achieving up to 73 minutes integrity. Tested at VNE to European Standard EN1363-1 (2000).